The Build it Green (BIG) Competition will provide technical assistance and engineering support services to selected New Jersey cities and utilities to design innovative, financeable projects that reduce combined sewer outflows (CSOs) while also making neighborhoods and downtowns better places to live, work and invest. New Jersey Future and re:focus partners today launched a competition intended to catalyze the design and implementation of integrated, creative projects that reduce combined sewer overflows (CSOs) while generating multiple local environmental and health benefits. 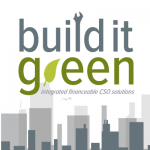 The Build It Green (BIG) Competition will select three New Jersey cities and/or utilities to receive customized technical assistance to design these CSO solutions. Selected cities and utilities will also receive engineering services (valued at approximately $17,000 per winner) to support the development of project implementation funding applications for submission following the BIG technical assistance process. All New Jersey CSO cities and utilities are encouraged to apply. Applications are due April 30 (Updated April 12). Up to three cities and/or utilities will be selected. David Zimmer, the executive director of the New Jersey Environmental Infrastructure Trust (NJEIT), agreed. “The Build It Green Competition is a great opportunity for municipalities and utilities to take innovative ideas from conception to the point where they’re ready for the NJEIT financing application process, and in return to get integrated solutions built that can be replicated across the state,” he said. Applications are due April 30 (Updated April 12). More information, including application materials, can be found here. Support for the BIG Competition was provided by grants from the Robert Wood Johnson Foundation’s New Jersey Health Initiatives program and the Geraldine R. Dodge Foundation. December 15, 2015 Introducing Jersey Water Works!